*CD Edition bringing together both LP volumes of this fantastic reissue, with liner notes from Kieran Hebden. It's a hauntingly spirited minimal /progressive/new age classic from 1978. Silver and gloss varnish-printed jacket. Includes liner notes by the author and Kieran Hebden. Mastering by Giuseppe Ielasi** "At long last, Die Schachtel relents and yields Lino Capra Vaccina's immense 'Antico Adagio' opus in two parts, available on LP and CD this week. 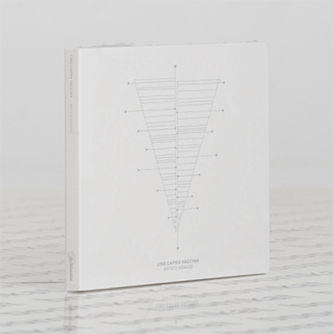 Antico Adagio was originally intended to be a double album, but was eventually scaled back to a single disc, self-released by the author in 1978; and thanks to the breadth and scope of Die Schachtel's excavations, the second unreleased album from the 1978 session is now available, alongside a reissue of the Antico Adagio legendary album! "Before an aberrant idea of progress and workaholic ethic ludicrously sped up our daily lives, even in the hectic city of Milan it was possible to "play slowly" – with no pressure, simply following the path your art was showing you. After a classic artistic journey and an experimental stint with Aktuala and other brilliant fellow musicians (like Franco Battiato, above all), Lino Capra Vaccina, near the end of the 70s, recorded Antico Adagio. It was an amazing album, anticipating countless future experiments in the field of new age and world music but also in avantgarde and electronic music. Apart from a few violin parts and the extraordinary vocal lines (sung by Vaccina himself and Juri Camisasca), Antico Adagio is an album fully built on percussions. But, at the same time, it's the farthest thing from the typical idea of percussions. You won't find a single trace of African or primitive beats: instead, this is a collection of rather long, subtle and thoughtful compositions, crafted with vibraphones, marimbas and gong. Together they create a work which will remain unique – both in Capra Vaccina's discography as well as in a more general sense."